By Alexis Leon Mathews Leon, A. Chitra & J. Suganthi, Vijay Nicole Imprints Pvt. Ltd., 2004. 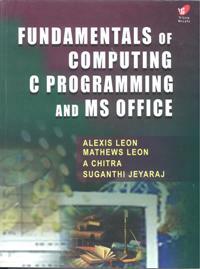 This book covers three important topics: Introduction to computers, C Programming and MS Office (MS Word and MS Excel) all so important for students throughout their careers. Designed as per the new Anna University syllabus for first semester, the book covers in toto the syllabi requirements of two papers--Fundamentals of Computers, C Programming and MS Office and Computer Practice I.